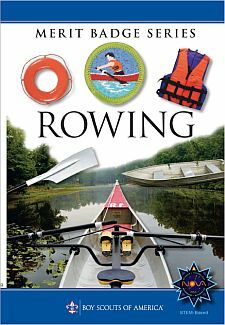 in the Rowing Merit Badge pamphlet (33404B or 35943), as shown below. In Boy Scout Requirements, the phrase "and how to prevent" was omitted. Before doing the following requirements, successfully complete the BSA swimmer test. Jump feetfirst into water over your head in depth. Level off and swim 75 yards in a strong manner using one or more of the following strokes: sidestroke, breaststroke, trudgen, or crawl; then swim 25 yards using an easy, resting backstroke. The 100 yards must be completed in one swim without stops and must include at least one sharp turn. After completing the swim, rest by floating. Review and discuss Safety Afloat and demonstrate the proper fit and use of personal flotation devices (PFDs). In a fixed-seat rowboat, come alongside a dock and help a passenger into the boat. Pull away from the dock, change positions with your passenger, and scull in good form over the stern for 10 yards, including at least one 180-degree turn. Resume your rowing position, return alongside the pier, and help your passenger out of the boat. Alone in a rowboat, push off from the shore or a dock. Row 10 yards to a swimmer. While giving instructions to the swimmer, turn the boat so that the swimmer can hold onto the stern. Tow him to shore. Show or explain the proper use of anchors for rowboats. Types of crafts used in commercial, competitive, and recreational rowing.